This is the Vegan Bagel Sandwich of my dreams, with tomatoes, red onion, jalapeño hummus, and tomato cayenne vegan cheese! This post was created in partnership with Field Roast. 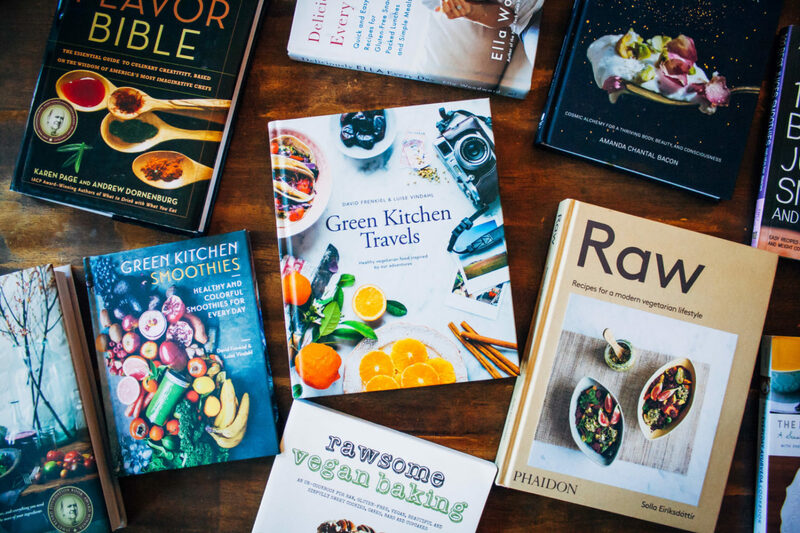 I first started eating their plant-based cheese when I began my plant-based journey almost four years ago, and I’m so excited to be working with them now. This is a product that I personally highly recommend – it tastes and melts like “real” cheese! For my boyfriend’s birthday last year, I got him tickets to see his (now our!) favorite team, the Tennessee Titans. It was an amazing game down in Nashville, and we had an incredible time watching our team win. One of the other best parts of the day was chatting with the tailgaters and seeing how far they had come to see the Titans – from all over the eastern seaboard! Everywhere I looked there were people cooking, playing games, and listening to music. We didn’t have a grill to tote along, though, so we brought bagels for breakfast! It was so nice to be able to immerse ourselves in the day and tour the stadium without having to worry about bringing, cooking on, and cooling off a grill. Which is why I’ll make the argument that a bagel sandwich is the perfect tailgating food. It’s quick to make at home, there are tons of flavor combinations, and you can just pack it up in some aluminum foil to go! I’d much rather be playing corn hole with a bagel in my hand than cooking on a grill!! I’ve had a lot of vegan bagel sandwiches in my day, and this one really wins them out. At every layer I tried to maximize flavor, with everything bagels, spicy garlicky jalapeño hummus, and Field Roast’s Tomato Cayenne Chao slices. 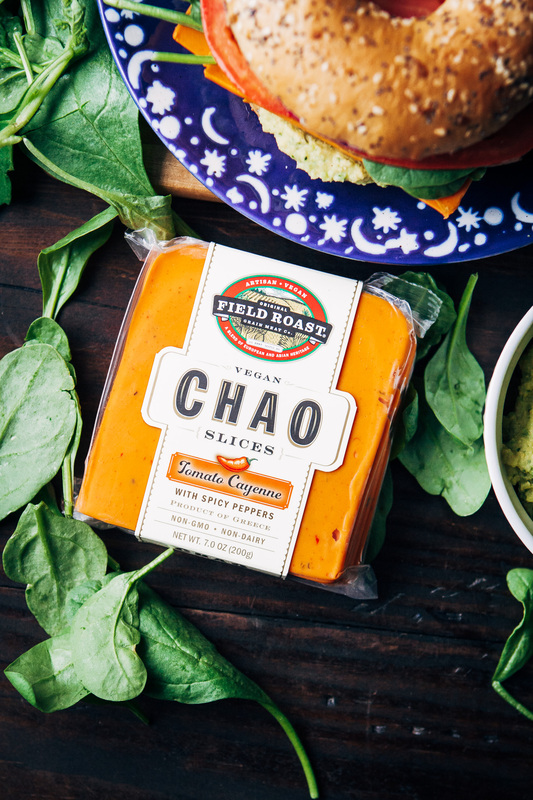 This cheese was the answer to my spicy-loving heart! It tastes SO GOOD on the sandwich, counterbalanced by fresh tomato and zingy red onions. Pack up a bunch of these for the fam and you’re all set to go for your tailgating day! 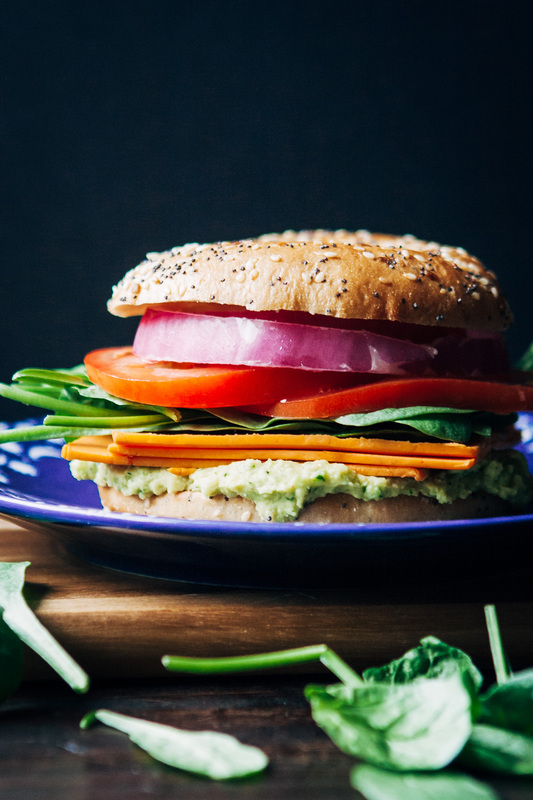 This vegan bagel sandwich is packed with flavor in every layer - with everything bagels, jalapeño hummus, and tomato cayenne vegan cheese! Start by making the hummus. Prep your jalapeño by removing the ribs and seeds. 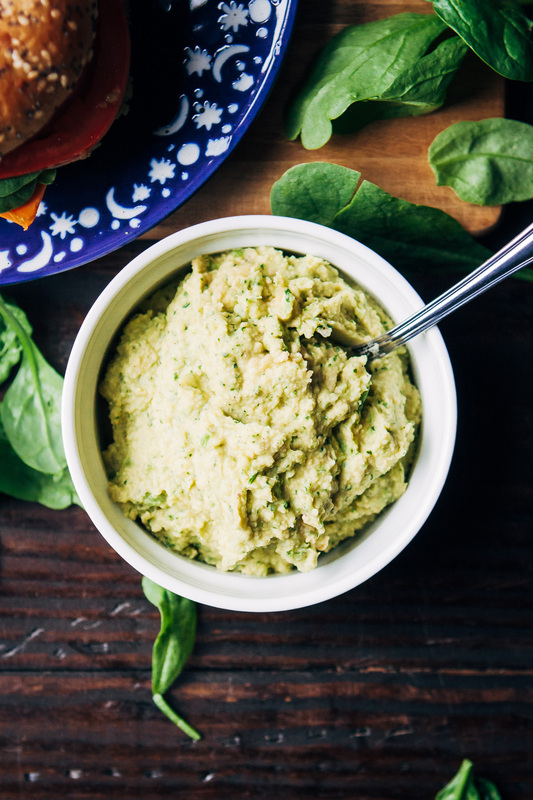 Add all ingredients into a food processor, and process on high until hummus reaches desired consistency. Then, toast your bagels either in a toaster or by broiling them in the oven for a few minutes. 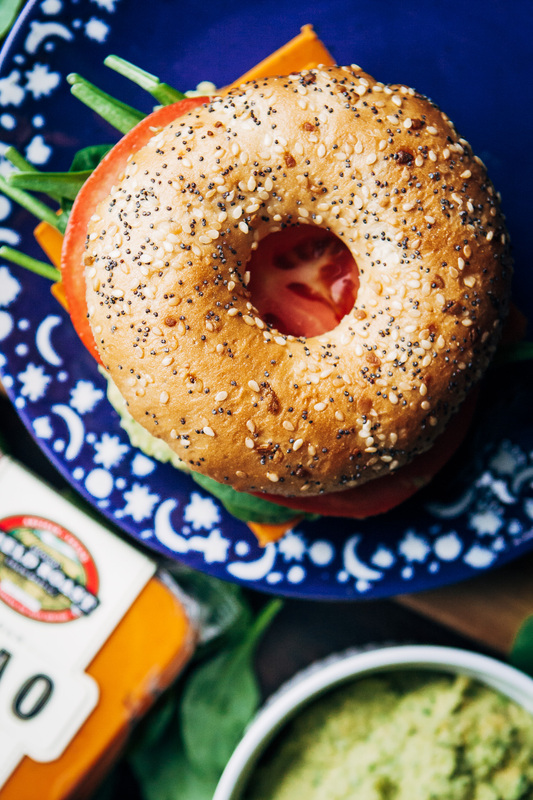 Assemble your bagels - add on a layer of jalapeño hummus, then the Field Roast Tomato Cayenne slices, then spinach, red onion, and tomato. If bringing to a tailgate, be sure to wrap the sandwiches in aluminum foil. There’s nothing better than a sandwich on a BAGEL! 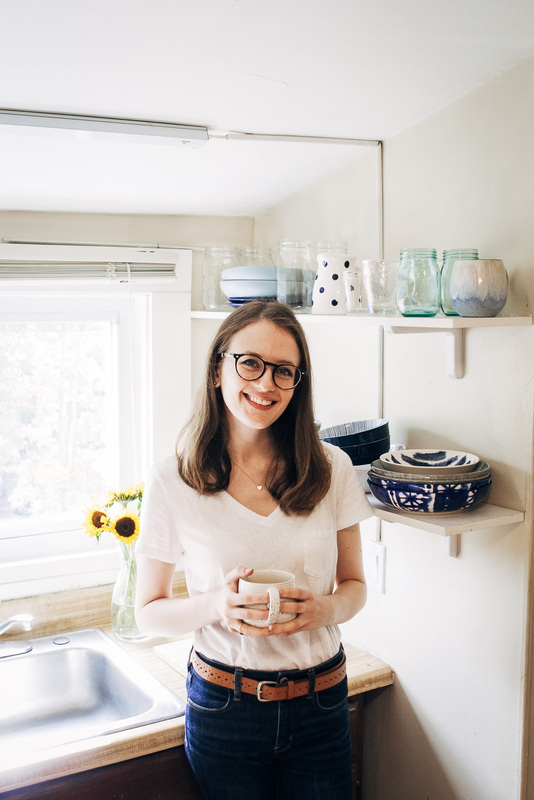 (Being from Montreal I’m truly bagel obsessed!) It all looks so yummy and easy to put together. And that cheese I’ve never seen here before I’ll have to make a trip to the states to find some, it looks sooo good!